Down behind enemy lines? Left to fend for yourself? These are the scenarios that inspired the LMF II. Former military man Jeff Freeman led the charge to engineer this fearless new 10" survival knife. And we field tested it with the troops. This knife is as adaptable as the personnel who carry it. Use it to cut through the skin of a fuselage. Or sever a seat belt. Or egress through the Plexiglas of a chopper. Plus, the LMF II does a slick job cutting firewood and building shelter. It can even be lashed to a pole to create a spear. 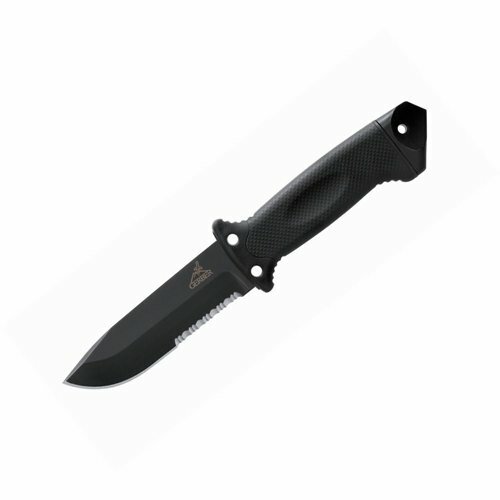 Overall Length: 10.59" Length of Blade: 4.84" Weight: 11.4 oz. Down behind enemy lines? Left to fend for yourself? These are the scenarios that inspired the LMF II. Former military man Jeff Freeman led the charge to engineer this fearless new 10" survival knife. And we field tested it with the troops. This knife is as adaptable as the personnel who carry it. Use it to cut through the skin of a fuselage. Or sever a seat belt. Or egress through the Plexiglas of a chopper. Plus, the LMF II does a slick job cutting firewood and building shelter. It can even be lashed to a pole to create a spear.